Abstract : Moving garments and other cloth objects exhibit dynamic, complex wrinkles. 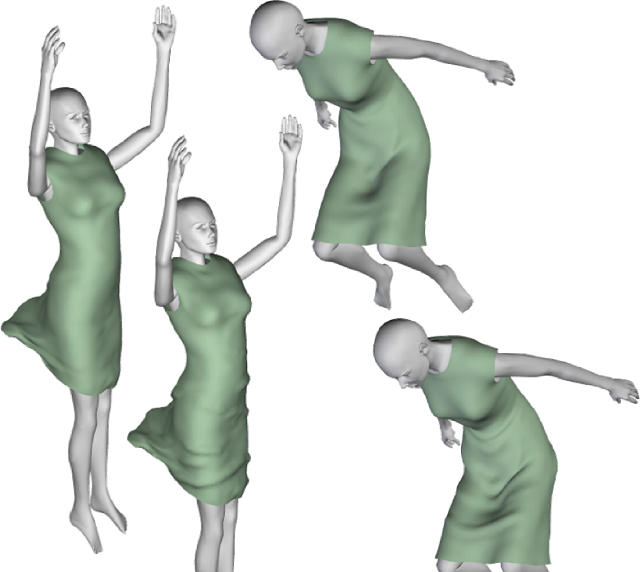 Generating such wrinkles in a virtual environment currently requires either a time-consuming manual design process, or a computationally expensive simulation, often combined with accurate parameter-tuning requiring specialized animator skills. Our work presents an alternative approach for wrinkle generation which combines coarse cloth animation with a post-processing step for efficient generation of realistic-looking fine dynamic wrinkles. Our method uses the stretch tensor of the coarse animation output as a guide for wrinkle placement. To ensure temporal coherence, the placement mechanism uses a space-time approach allowing not only for smooth wrinkle appearance and disappearance, but also for wrinkle motion, splitting, and merging over time. Our method generates believable wrinkle geometry using specialized curve-based implicit deformers. The method is fully automatic and has a single user control parameter that enables the user to mimic different fabrics.